CLEAN BANDIT. DOUBLE RED VINYL LP ALBUM. RED VINYL DOUBLE LP. NEW AND SEALED. 'WHAT IS LOVE'. AND WE LOOK FORWARD TO YOUR CUSTOM IN THE FUTURE. (12 EMP 120). EMI Records. Dirty Love. Vinyl Condition : VG. BLUE VINYL 45 rpm PYE CAF132A/132B. Title: LOVE ON SIGHT. Year: 1985. Artist: COLORS (80'S GROUP). "Teenage Romance" /"Shelly My Love". Style Doo Wop. You can listen to samples of both sides. 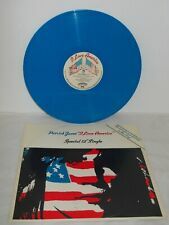 Special Attributes Colored Vinyl. 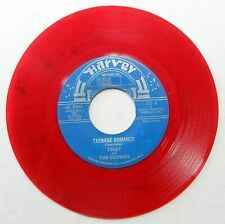 Pressed on red vinyl. HARVEY 103. LABEL: Abnak AB 135. Record Label Abnak. ARTIST/TITLE: JON & ROBIN - Gift of Love. Artist Jon & Robin. INFO: PROMO on yellow vinyl. YEAR: 1969. Style Pop Rock. Special Attributes Promo. Artist: DON MCLEAN. Label: EMI. Year: 1977. Title: WHEN LOVE BEGINS. Country of Origin : UK. This is one of 10000 singles LP's, 12” and 7" that I HAVE COLLECTED OVER THE LAST 30 YEARS; they run from the 1950's to the 2000's and cover every style of music. A1: WE LOVE THE MOON. THE ROYAL FAMILY. LABEL: PROJECT. B1: WHITE STAINS. The Three Degrees 7" 45 rpm Picture Sleeve BLUE Vinyl Ariola Records ARO 141 1978. A Side Woman In Love. Vinyl V Good Condition. Label: POPCOR. Artist: SMASH. Title: LADY LOVE YOUR C T. Year: 1993. Label: POLYDOR. Title: START TALKING LOVE. Year: 1988. TRACEY ULLMAN. A1: HELPLESS. B1: FALLING IN & OUT OF LOVE. MAY COLLECT FROM CORBY. ARTIST; RAYDIO. CAT NO; ARIST 193. RELEASED; 1978. Spindle marks may be present. An LP cover may have slight signs of wear, and may be marred by a cut-out hole, indentation, or cut corner. S.M.A.S.H: Another Love (Song) EP EX RED VINYL 12"
Disc: EX (uncleaned vinyl, plays really well). B1: HEATWAVE. MARILYN MONROE. A1: WHEN I FALL IN LOVE. MAY COLLECT FROM CORBY. THE ORIGINAL POLY SLEEVE IS IN GOOD CONDITION. IT DOES HAVE A TAPED UP EDGE BUT MAYBE THATS FOR THE BEST 👍. THE VINYL IS IN EXCELLENT ORDER. IT HAS A NICE SHEEN TO IT AND PLAYS THROUGH BANG ON 🤟🤟. Clear vinyl BEAUTIFUL fully legitimate reissue 45. this reissue is from 1996. Special Attributes Reissue. SO YOUNG AND SO IN LOVE. Record Grading Near Mint (NM or M-). Country/Region of Manufacture United States. Future Pilot AKA ‎– Eyes Of Love. Electronic ,Rock ,Pop ,Folk, World, & Country. Broken Beat ,Brit Pop ,Folk ,Hip Hop. Vinyl, 7", EP, 33 ⅓ RPM. U.S.A. (Rest Of World ) - £12.00 airsure. ALL RECORDS HAVE BEEN VISUALLY CHECKED - I HAVE NOT PLAYED THE RECORD SO HAVE TRIED TO BE AS ACCURATE AS POSSIBLE. BACHELORS 45. You've lied / I found love. ROYAL ROOST - 620 REPRO RED WAX. Record Grading M- Repro red wax. Duration Single. UPC Does not apply. Special Attributes Colored Vinyl. Record Size 7". This Vinyl is in great condition, from my own collection that has been well looked after. All photos taken by myself and exactly what you'll receive, perfectly packaged. From one collector to another. Tracklist A Your Love's A Great Color On Me B Your Love's A Great Color On Me (Tim Deluxe Remix) Do check out my other items as I will be adding more vinyl from so many genres. Items will be sent soon as I can, after payments are made (if you win multiple Vinyl, I'm happy to invoice all items for one price of postage, if requested. Up to 2 KG in weight & under £50 in value for insurance reasons. Extra Details: Rare original 7", great condition, vinyl is unplayed and there is a biog/press release also in the sleeve. Record: Unplayed vinyl. Year of Release: 1983. Used vinyl can have a crackle in places. Picture Disc. Call It Love. Label: THUNDERBAY. Artist: JODY FEATURING DEREK AND JUDE. Country: UK. ~ FEARGAL SHARKEY. Producer –Feargal Sharkey 3:23. ~ LOVING YOU. A Loving You. Vinyl removed from outer sleeves to prevent sleeve split. SLEEVE: EX. EXCELLENT: The record shows a few minor signs of having been played, but there is very little lessening in sound quality.